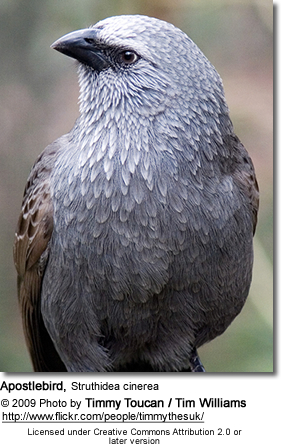 The Apostlebird (Struthidea cinerea), also known as the Grey Jumper, is a quick-moving, gray or black bird about 13 inches (33 centimetres) long. It is a native to Australia where it roams woodlands, eating insects and seeds at, or near, ground level. Apostlebirds always seem to travel in groups of about 12; for this reason they were named after the Biblical apostles - the twelve chief followers of Jesus Christ. Measuring around 33 cm (13 in) in length, the Apostlebird is a predominantly dark grey bird with a long black tail tinted greenish in sunlight. The grey feathers on the head, neck and breast are brushed with paler grey-white and the wings are brownish. The legs and bill are black and the eyes brown or white. The natural range is across inland eastern Australia, from the mallee regions of northern Victoria and easten South Australia, north through New South Wales and central-western Queensland to the Gulf Country. There is an isolated population in the Northern Territory. Dry open woodland is the preferred habitat, especially Callitris in New South Wales and Casuarina in Queensland, and Lancewood-Bulwaddi communities in the Northern Territory. 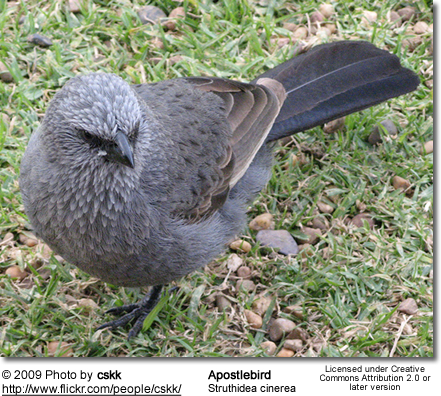 Apostlebirds are a communal species with each family group generally containing only one breeding pair, the rest being their helper offspring. All family members help construct a mud nest, and share in incubation of the eggs. Once the eggs are hatched, all members of the family group also help feed the chicks and keep the nest clean. Breeding season is from August to December. The nest is a deep cup-shaped structure made of grasses held together with mud or sometimes manure in a tree fork up to seven or eight metres above the ground. Three to five pale blue-white eggs sparsely splotched with brown and lavender shades are laid measuring 22 mm x 29 mm. Thye are tapered oval in shape. 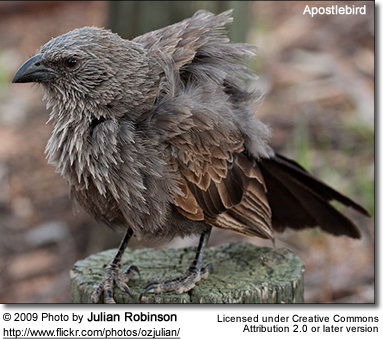 The Apostlebird is listed as threatened on the Victorian Flora and Fauna Guarantee Act (1988). Under this Act, an Action Statement for the recovery and future management of this species has not yet been prepared. On the 2007 advisory list of threatened vertebrate fauna in Victoria, the Apostlebird is not listed as a threatened species. 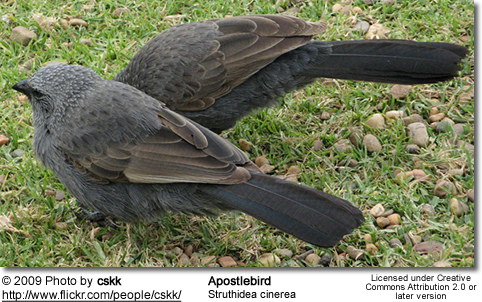 Originally described by ornithologist John Gould in 1837, its specific epithet is Latin cinerea "grey". In its own genus Struthidea, it is placed in the family known as the mud-nest builders or Corcoracidae, written as Grallinidae in older books before the removal of the genus Grallina to the Wagtail family. It is one of two remaining species, with the White-winged Chough (Corcorax melanorhamphos), which differs in appearance but exhibits many behavioural similarities. The mudnest builder family Corcoracidae itself is now placed in a narrower 'Core corvine' group, which contains the crows and ravens, shrikes, birds of paradise, fantails, monarch flycatchers, and drongos. 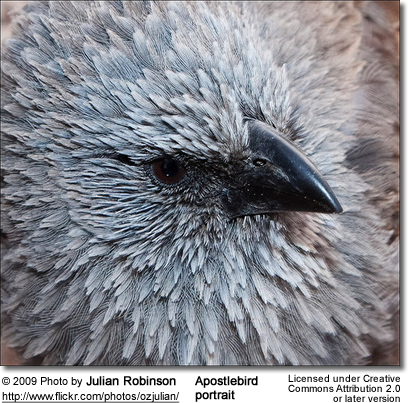 The Apostlebird was named after the Biblical apostles - the twelve followers of Jesus Christ. In fact, the species travel in family groups of between 6 and 20, which may coalesce with other family groups into large feeding flocks of over 40. Their gregarious nature, and harsh scolding/grating calls have lead to a plethora of colloquial names. They can be known locally as Lousy Jacks (due to heavy louse infestations), Happy Jacks, Happy Families and CWA Birds. The latter name is mildly derogatory, referring to the supposed resemblance of Apostlebird's constant chatter to a Country Women's Association meeting. Grey Jumper is an alternate name.